We examine the diurnal cycle of marine cloud feedback using high frequency outputs in CFMIP-2 idealised uniform +4 K SST perturbation experiments from seven CMIP5 models. Most of the inter-model spread in the diurnal mean marine shortwave cloud feedback can be explained by low cloud responses, although these do not explain the model responses at the neutral/weakly negative end of the feedback range, where changes in mid and high level cloud properties are more important. All of the models show reductions in marine low cloud fraction in the warmer climate, and these are in almost all cases largest in the mornings when more cloud is present in the control simulations. This results in shortwave cloud feedbacks being slightly stronger and having the largest inter-model spread at this time of day. 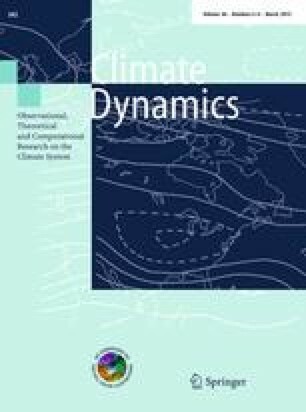 The diurnal amplitudes of the responses of marine cloud properties to the warming climate are however small compared to the inter-model differences in their diurnally meaned responses. This indicates that the diurnal cycle of cloud feedback is not strongly relevant to understanding inter-model spread in overall cloud feedback and climate sensitivity. A number of unusual behaviours in individual models are highlighted for future investigation. We would like to thank Knut von Salzen and William Ingram for helpful comments on the manuscript, and Mark Ringer and Tim Andrews for useful discussions. This work was supported by the Joint DECC/Defra Met Office Hadley Centre Climate Programme (GA01101). The research leading to these results has received funding from the European Union, Seventh Framework Programme (FP7/2007–2013) under grant agreement number 244067 via the EU Cloud Intercomparison and Process Study Evaluation project (EUCLIPSE). We acknowledge the World Climate Research Programme’s Working Group on Coupled Modelling, which is responsible for CMIP, and we thank the climate modelling groups for producing and making available their model output. For CMIP the U.S. Department of Energy’s Program for Climate Model Diagnosis and Intercomparison provides coordinating support and led development of software infrastructure in partnership with the Global Organization for Earth System Science Portals. We would like to acknowledge in particular Philip Bentley, Alejandro Bodas-Salcedo, Sandrine Bony, Jason Cole, Herve Douville, Jean-Louis Dufresne, Hideaki Kawai, Jamie Kettleborough, Tsuyoshi Koshiro, Carlo Lacagnina, Marc Salzmann, Frank Selten, Yoko Tsushima, Sophie Tyteca, and Jonny Williams for their efforts in preparing cfSites outputs from the models.